As our three parishes begin to work together as a Cluster, I thought it would be a good time to review our parish histories. During the summer I will be using this column for that purpose. The church buildings that we celebrate the Eucharist in each week have all been around for quite a while. St. John the Evangelist Church was built in 1880, St. Patrick Church in 1890, and St. Francis of Assisi in 1930. 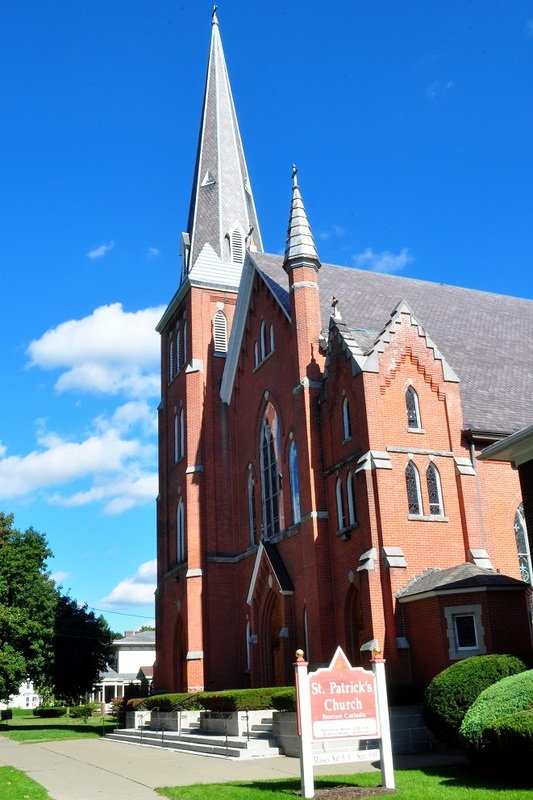 While the church buildings have been around a long time, the presence of the Roman Catholic community in Tioga County has been around even longer. Many Irish laborers moved to Upstate New York with the building of the Erie Canal system and the network of railways. A number of these immigrants chose Owego as their place of residence. 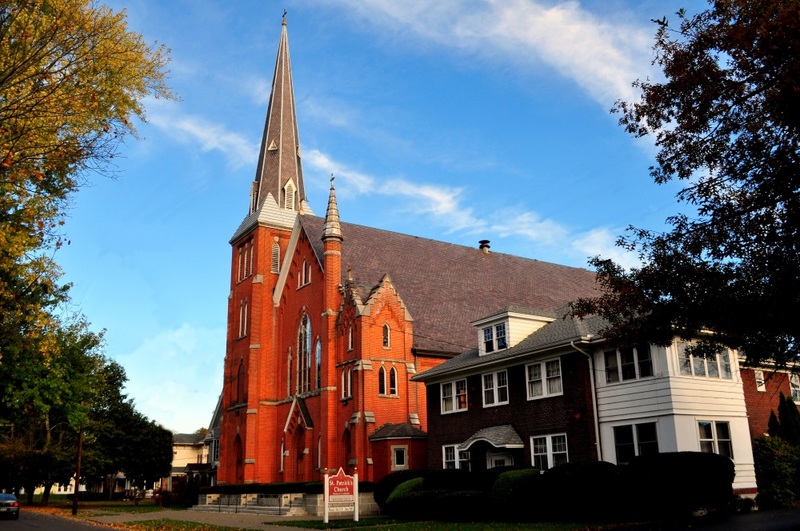 Records of a Catholic congregation in Owego date back to 1839. The first missionary through the Owego area was the Rev. James F. Hourigan who came on horseback as early as 1839, to conduct services for Catholics working on the railroad. The first regular church services in Owego were held in the home of David Connelly on Paige St.. A second floor addition was built on his home to be used as a chapel. 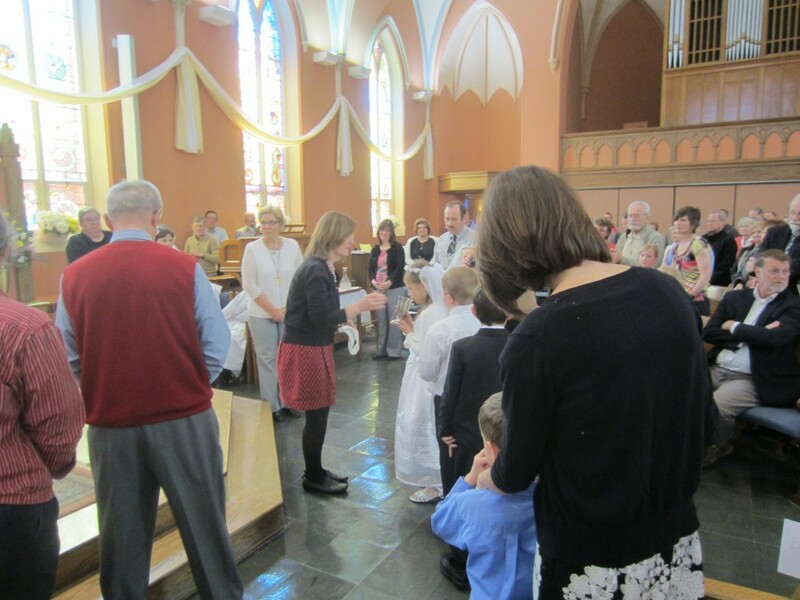 It was in the chapel that the Mass was celebrated and Sacraments were received. In August, 1842, Charles Pumpelly made a gift of land for a church and burying ground to the Right Rev. John Hughes, Bishop of the Diocese of New York. In 1843 Bishop Hughes appointed Rev. Andrew Doyle as pastor of St. Patrick Church, Binghamton. Father Doyle came occasionally to the mission territory of Owego to conduct services. 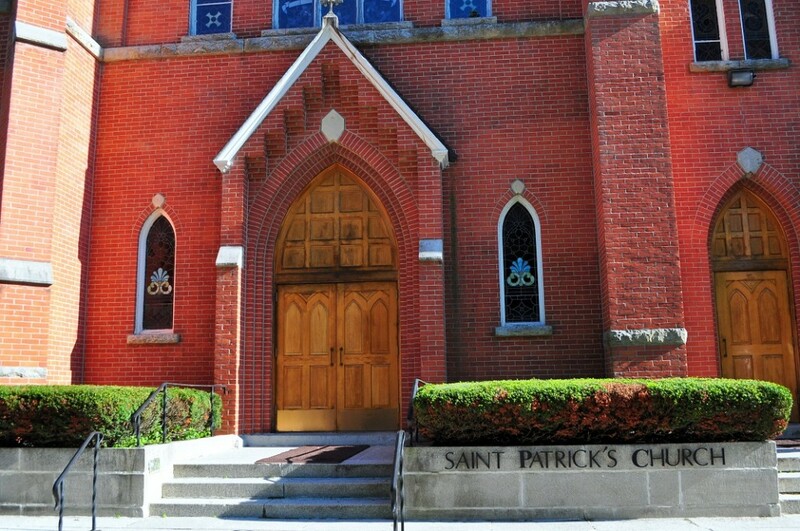 In 1844 St. Patrick’s received its first resident pastor, the Rev. John Sheridan. When the Buffalo and Albany Dioceses were founded in 1848, Tioga County became a part of the Buffalo Diocese. Also in 1848 Father Sheridan purchased the land on which the present church is located from Thomas Farrington for $545.50. He had a small wooden church built on the site. Father Sheridan was succeeded, in August 1850 by the Rev. Michael Creedon, in 1851 by Rev. P. Mallon, and in January 1852 by Rev. James McManus. Father McManus purchased a house and lot next to the church for a parochial residence. Father McManus was succeeded by Rev. Nicholas Byrne in 1858. In 1859 Father Byrne built the first parochial school house at the rear of the church building. In 1860 Rev. Joseph Butler became pastor, he was followed by Rev. S. Bonaventure Corney in 1862, and Rev. Francis Clark in 1863. During Father Clark pastorate, the church was enlarged, and a new steeple and bell were added. In 1869 the rectory was given to the Sisters of Mercy for their Convent and Father Clark purchased the house and lot to the west for use as the rectory. It served in that capacity until 1932 when the current rectory was built. As the American Civil War came to and end Father Francis Clark was pastor of St. Patrick’s. In 1870 Father Clark celebrated the first mass in Candor in the home of Mr. Kehoe. The Kehoe residence remained a center of Catholic devotion in the Candor community for over 65 years. 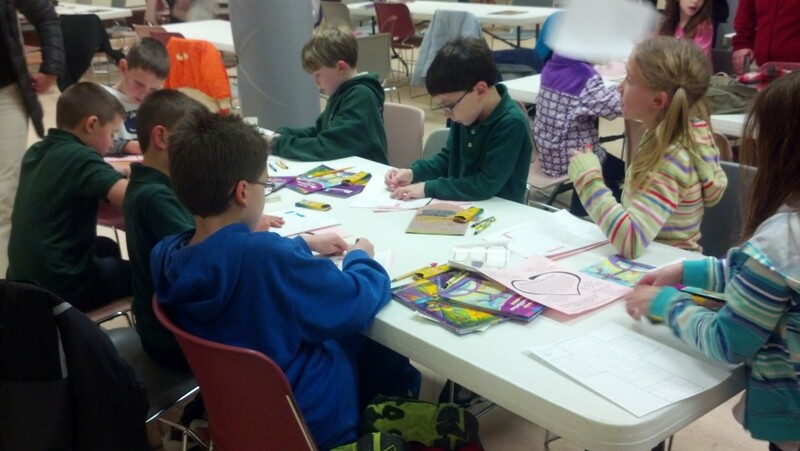 During Father Clark’s pastorate five Sisters of Mercy under the leadership of the Rev. Mother Stanislaus, arrived from Batavia to serve in the parochial school. 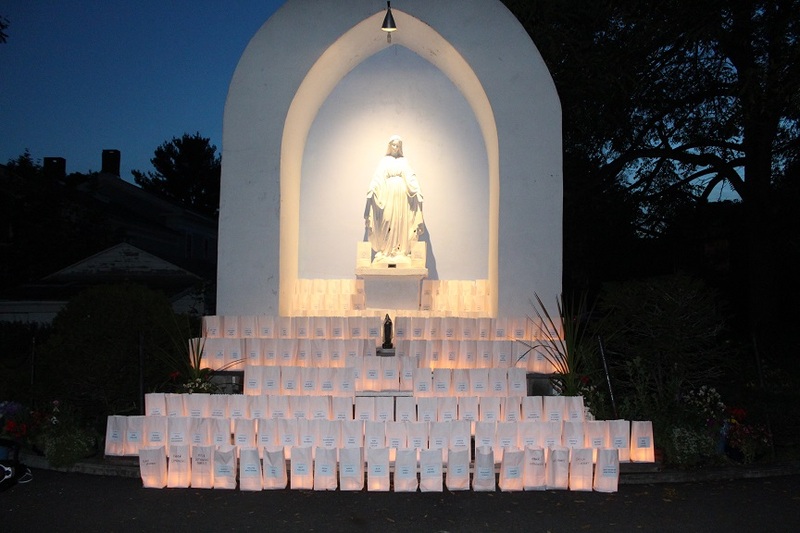 In just two years time there were nineteen Sisters of Mercy serving in Owego. Several pastors came and went following Father Clark and their pastorates should be recorded: the Rev. James Rodgers from 1871-1877, Rev. John O’Mara was pastor from 1877-1883, the Rev. Thomas D. Johnson from 1883-1893. Both Father O’Mara and Father Johnson were buried in the parish’s first cemetery, St. Joseph’s Cemetery. 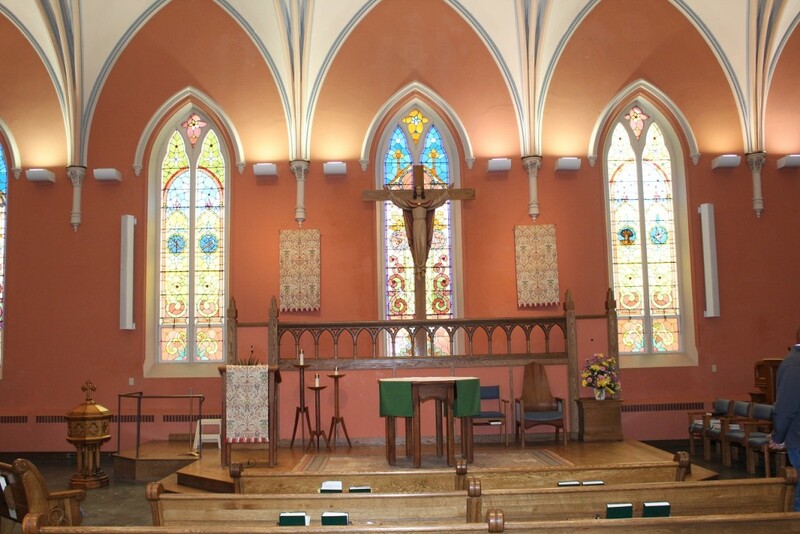 During Father O’Mara’s pastorate the mission church St. John the Evangelist was built and dedicated in 1881. During Father Johnson’s pastorate the current St. Patrick’s Church was built and dedicated on December 7, 1890. The Most Rev. Stephen V. Ryan, Bishop of Buffalo, presided at the dedication ceremony. In September of 1893 Father Johnson died, and was succeeded by the Rev. Martin Ryan, who served in the parish until May, 1995. Because of poor health Father Ryan returned to Ireland on a leave of absence and died there on Jan. 9, 1909. During his absence two priest were appointed administrators of St. Patrick’s; Rev. Jeremiah Moriarty from 1885-1899, and Rev. John J. Sheridan, a newly ordained priest from Binghamton, from 1899-1909. The Christ-like zeal of Father Sheridan soon endeared him to the people of Owego. During his time of service the indebtedness for the new church was paid off. In July 1909 Father Burns was named pastor. He formed many of the spiritual organizations. He created a sodality for girls called the Junior Children of Mary, and another society for boys called Holy Name Cadets. He also organized a men’s society, the Holy Name. In January, 1911 Father Burns was recalled to Rochester by Bishop Hickey to build the Sacred-Heart Pro-Cathedral, which now serves as the Cathedral for the Diocese. After Father Burns was reassigned, Rev. Michael J. Garvey was appointed pastor. He had to resign due to poor health after serving only nine months. He was succeeded by the Rev. Francis E. McCrone who continued as pastor until 1929, having served the longest pastorate in the history of the parish at that time. As our country was beginning to experience the effects of the Great Depression, St. Patrick Parish was experiencing much growth and with it change. 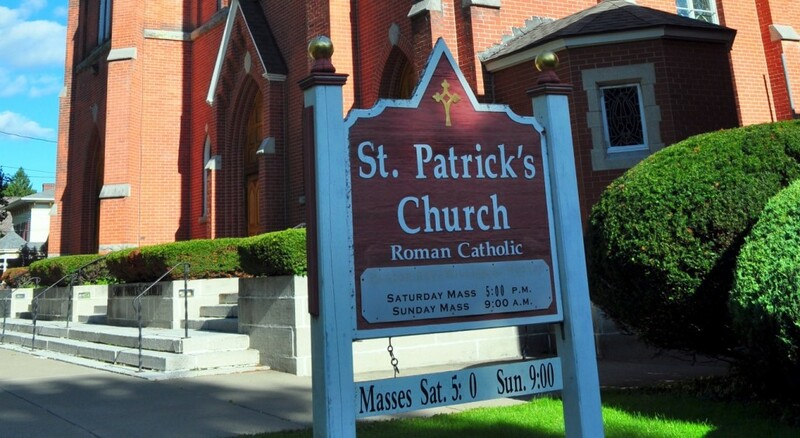 In 1929 Father Francis McCrone’s eighteen year pastorate came to an end as he was appointed to St. Patrick Church, Elmira. Rev. Arthur Smith succeeded him as pastor. As the parish entered the 1930’s it had grow enough to warrant assistant pastors being assigned to the parish. Father Smith began plans to build a new rectory. 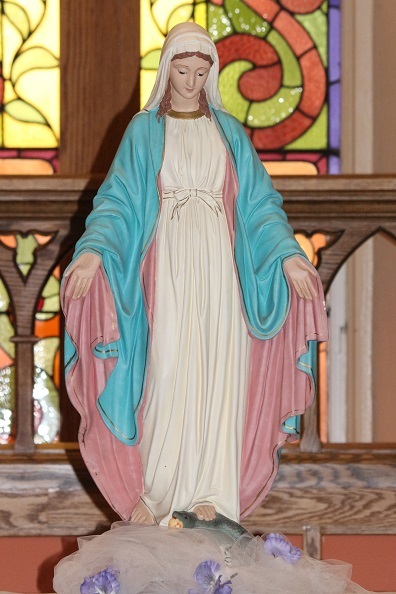 The old rectory was torn down and a Shrine to Our Blessed Lady was built on the sight. The Convent building was moved from its location on Main St. to the rear of the church property and placed in line with the parish school. The Convent was then remodeled for the Sisters by Dec. 18, 1929. The parish school was redecorated, as was the church sanctuary, and the church basement was converted into a church hall for the parish social activities. The new Rectory was then built in 1932 along side the church. After completing the building projects Father Smith was succeeded in 1932 by the Rev. Michael L. Hynes. 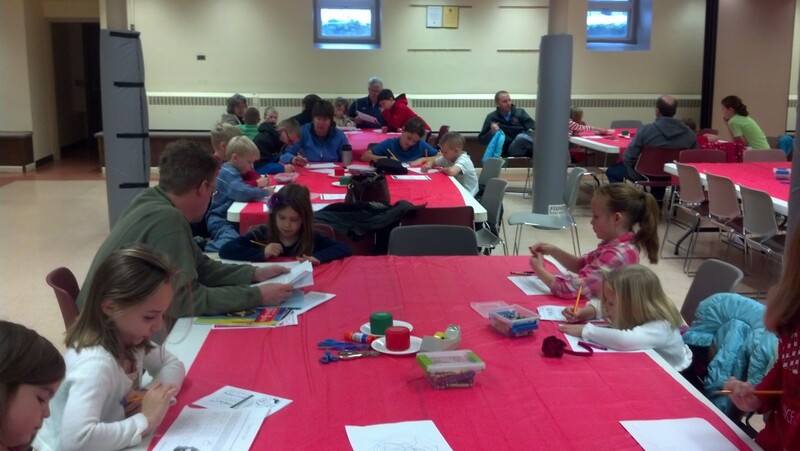 During Father Hynes’ pastorate the parish celebrated it 100th Anniversary. The Most Rev. James E. Kearney, D.D., Bishop of Rochester, presided at a Pontifical Mass on October 4, 1942 in the church which was completely repaired outside and redecorated inside to mark the special occasion. Shortly after the Centenary celebration the parish purchased the Former Stanbrough home and extending the church property from Main Street to Front Street. Father Hynes also purchased a lot west of St. Joseph’s Cemetery. The purchase doubled the size of the cemetery, which was renamed St. Patrick’s Cemetery. In the fall of 1950, Father Hynes presided over the formal dedication ceremony of the new St. Patrick’s Parochial School. The new school building was connected directly to the old Stanbrough residence. In 1953 Father Hynes was forced to resign his pastorate due to ill health, after having served over 20 years as pastor having surpassed Father McCrone’s record of 18 years. Father Jankowski, Father Alex Stec, Father Dinolfo, and Father Joseph Hogan were the priests assisting Father Hynes during these years. In February 1953 Rev. William J. O’Brien came to Owego from Livonia as the new pastor of St. Patrick’s. 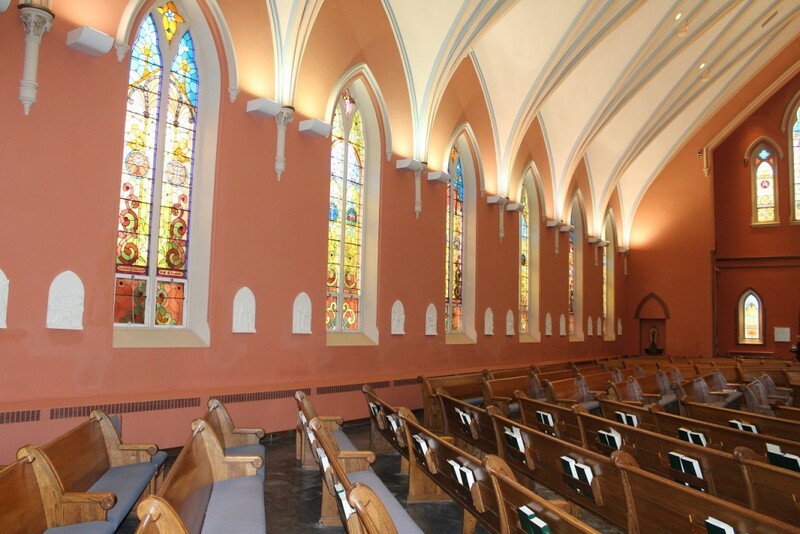 In 1956 Father O’Brien began plans for the complete renovation of the interior of the church. 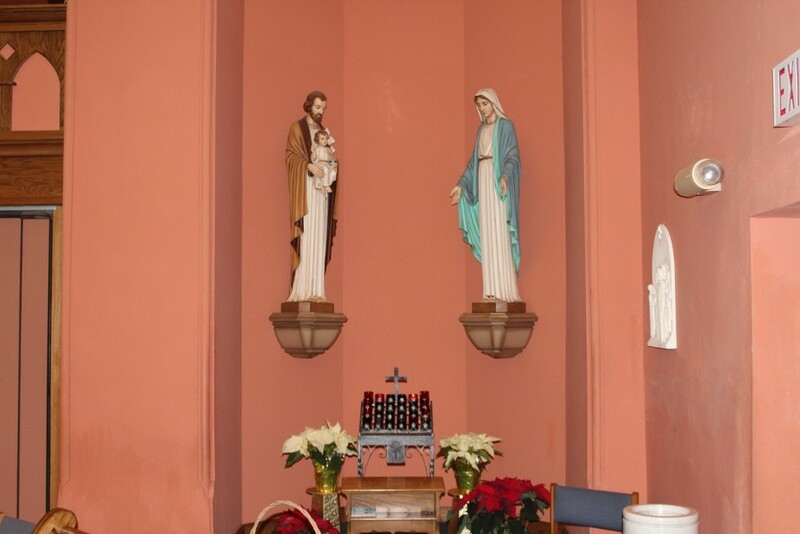 By Christmas of 1957 St. Patrick’s was completely redecorated with new altars, carpeting, a new baptistry, sacristy, heating system and a modernized church hall. During his pastorate Fathers Bruce Ammering, Michael Regan, Eugene Emo, and Edward Foy assisted him. Father O’Biern died of a heart attack on July 27, 1965 only a few years after celebrating the Silver Jubilee of his ordination. Father O’Brien was buried in the new section of St. Patrick’s Cemetery. Following the death of Father O’Brien, the Rev. Leo Matuszewski became the pastor of St. Patrick’s on August 11, 1965. Father Mat and his assistant Father John Dettleff, following the spirit of the Second Vatican Council, were very instrumental in developing an ecumenical spirit of cooperation with the other Christian churches in the Owego area. 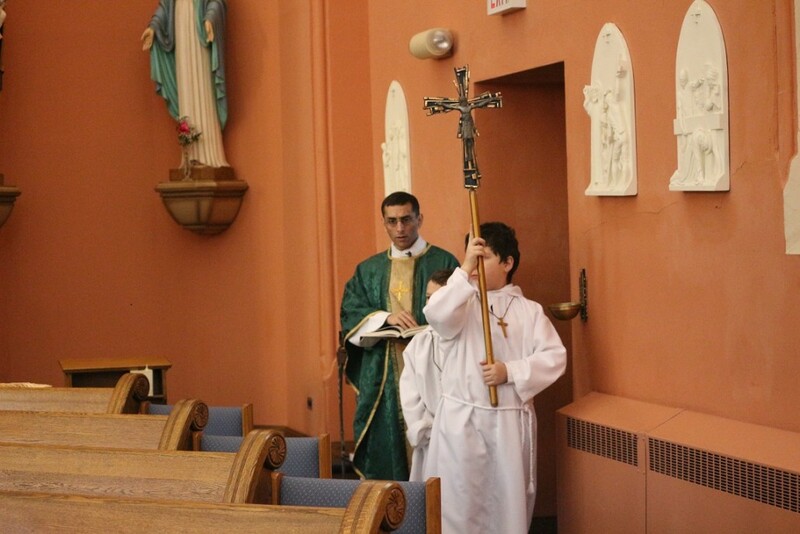 They also helped to implement the change to the new Eucharist Liturgy called for by the Council. 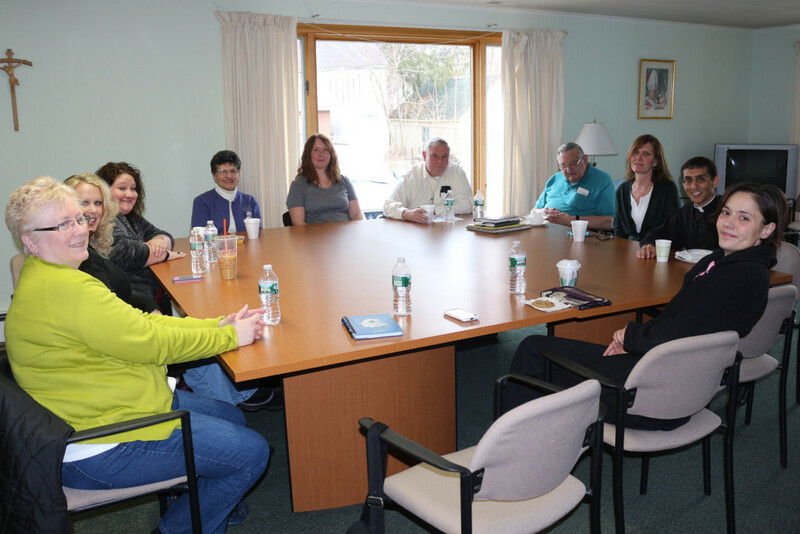 It was at this time that steps were taken towards the reorganization of the parish structure and the Parish Council was organized. Also, during Father Mat’s pastorate a new six-classroom addition to St. Patrick’s School was constructed do in large part to the generous donation from the estate of Dr. and Mrs. Charles V.R. Redding. The Most Rev. Fulton J. Sheen, Bishop of Rochester dedicated the new school on September 24, 1967, at a special ceremony to mark the occasion. In spite of the fact that the new school was built, the junior high level grades of the school were closed due to soaring financial costs. In 1968, St. Patrick’s began the first broadcasting of the Mass over the radio. Jim Raftis continued to faithfully carry out this special ministry as broadcaster for the next thirty years. In 1970 Father Dettleff was granted a leave of absence from his parish responsibilities and the Rev. Thomas Watts came to St. Patrick’s as assistance pastor. In 1973 the parish, with the support of Father Matuszewski and the Parish Council, adopted a team ministry concept and requested the appointment of Co-Pastors. Rev. Thomas Watts, the then assistant pastor, was appointed as Co-Pastor along with Rev. Albert Cason. Their Co-Pastorate was during a time when many renewal movements were active in the church. Many of St. Patrick’s parishioners were involved in the following renewal movements. Cursillo, a vital and spirit filled renewal group emphasizing the formation of Christian leaders. Marriage Encounter, which stresses communication and faith commitment in marriage. The Charismatic renewal stressing the working of the Holy Spirit in the daily life of Christians, and Teen Seminar and Reality group helped high school students grow in their personal relationship with Jesus. 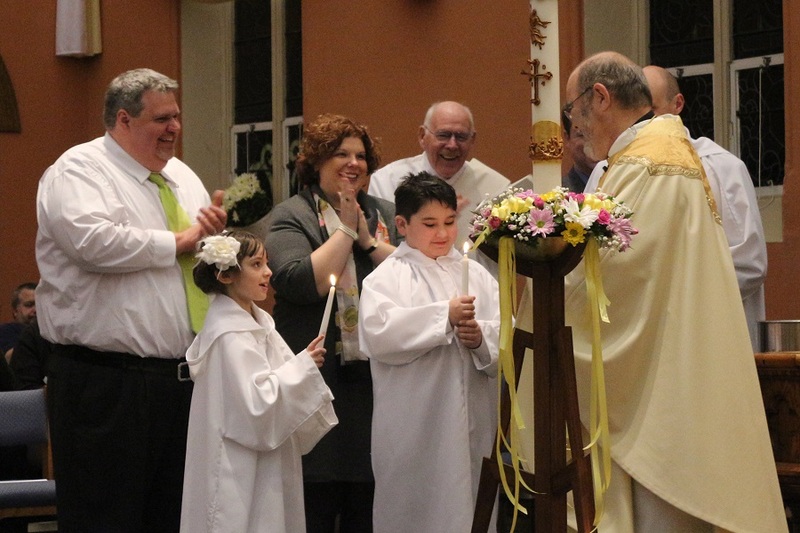 In the 1980’s the Diocese re-established the permanent Deaconate, and St. Patrick’s was blessed to have three parishioners ordained as deacons and serve in the parish. 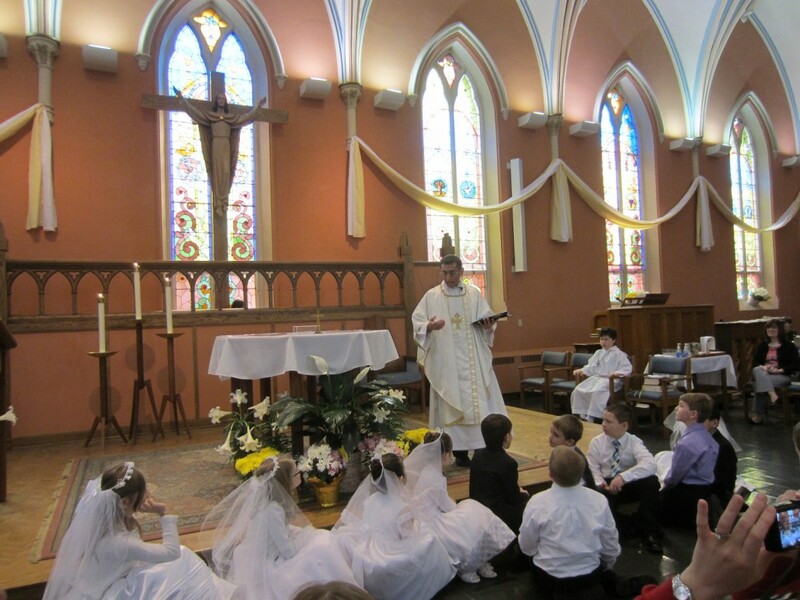 Deacon Robert Dizer was ordained with the first permanent deacon class in our diocese in 1982. 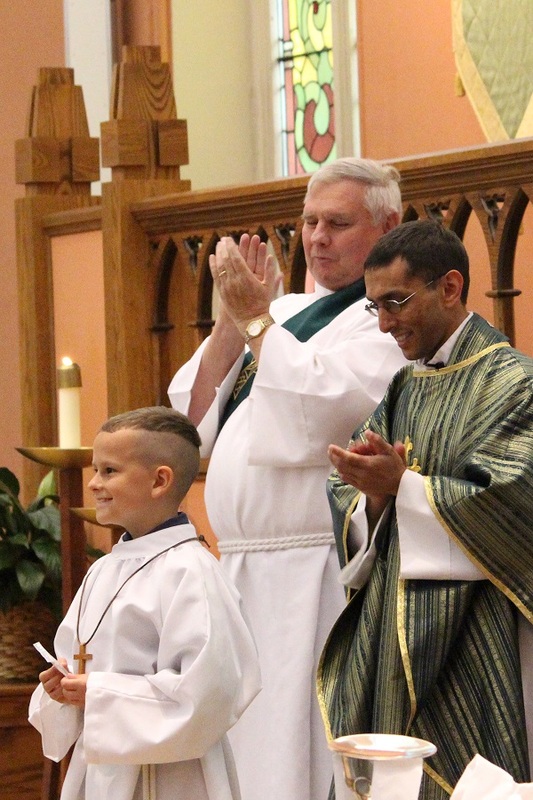 He was followed in ordination by Deacon George Burnett and Deacon John Boburka. In 1984 Father Cason stepped down as Co-Pastor and Father Watts remained as Pastor. In January of 1985 the Rev. William Darling came to St. Patrick’s to assist Father Watts. In June of 1987 after having served St. Patrick’s for seventeen years as Assistant Pastor, Co-Pastor, and Pastor, Father Watts transferred to Waverly and became Pastor of St. James. Father Darling at that time was appointed Pastor, and Rev. Scott Kubinski was appointed Associate Pastor, or Parochial Vicar, as the revised Canon Law titled the position. In June of 1990 Father Kubinski was transferred to St. Ambose, Rochester, leaving the parish with one priest. It was then the Father Darling hired the first Pastoral Associate to minister in the parish, Sister Ann Louise Henteges. 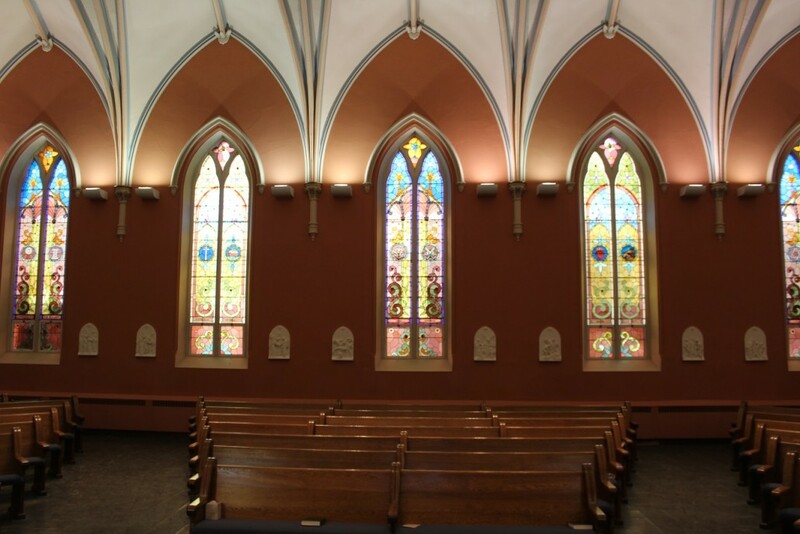 During Father Darling’s pastorate the parish undertook a fund drive to renovate the church for its Sesquicentennial. 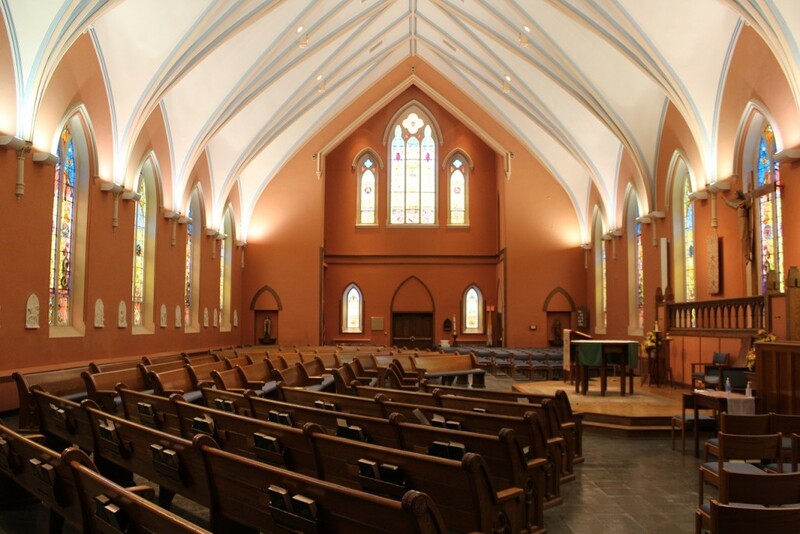 The 100 year old church was renovated or refurbished for the seventh time in it history, following the restoration and changes done in 1913, 1932, 1942, 1957, 1965, and 1975. 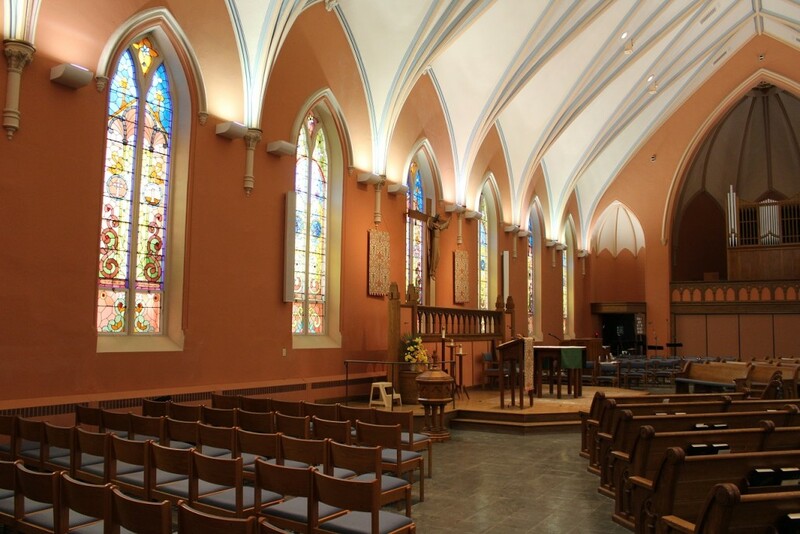 Each time that new renovations took place they reflected the theology of the time and were done to assist the parishioners in the current church rites of celebration. The same was true of the changes done under Father Darling that altered the seating arrangement and worship space to reflect the Vatican II emphasis of the Church as the People of God. 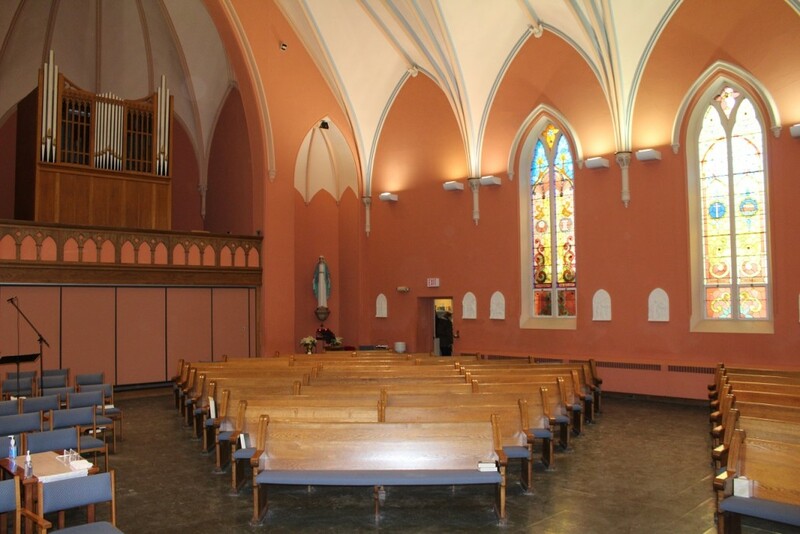 The renovation of the church was not completed as the parish reached its 150th anniversary on December 7, 1992. 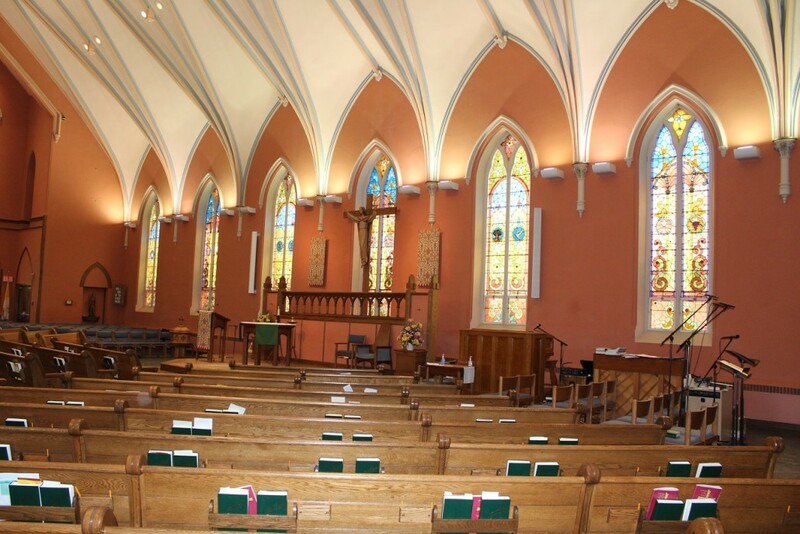 A rededicated ceremony was held in the renovated church on August 7, 1993 with The Most Rev. 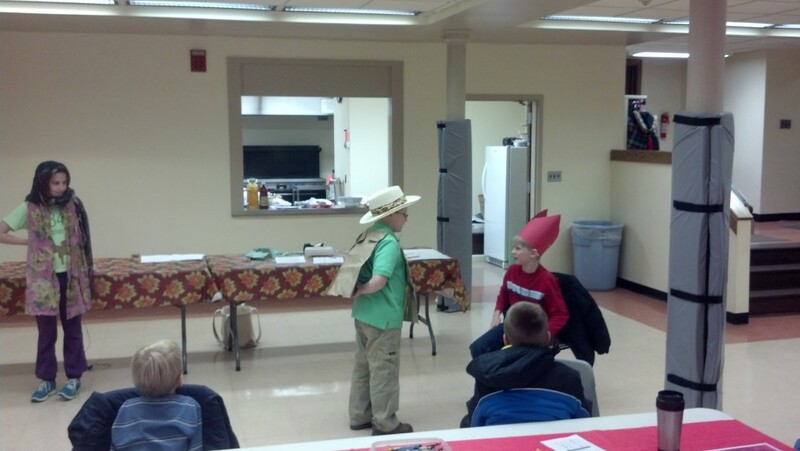 Matthew H. Clark, Bishop of Rochester, presiding. Rev. Philip Billotte server as Administrator of St. Patrick’s from June -December 1993 while Father Darling was on sabbatical. 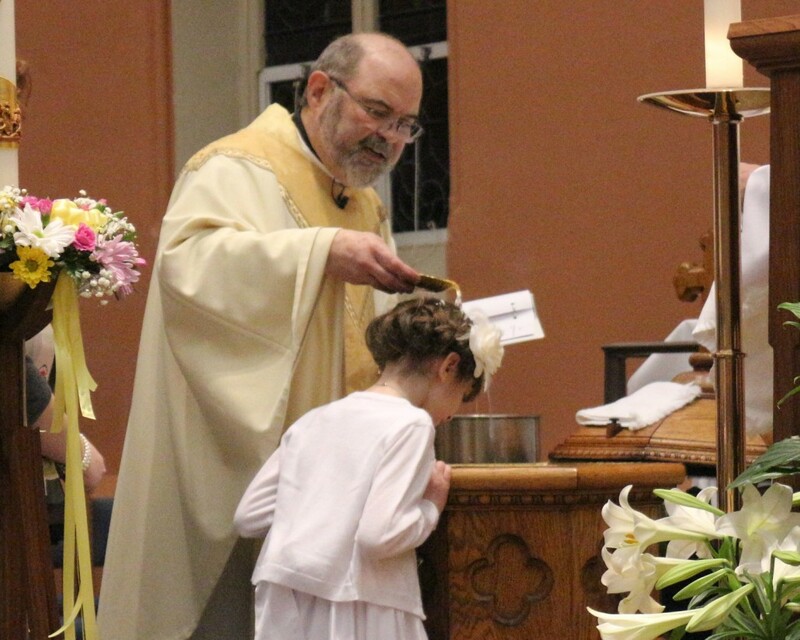 After returning from sabbatical, Father Darling completed his term as pastor of St. Patrick’s in June of 1994, when he transferred to Rochester as pastor of St. Salome’s. 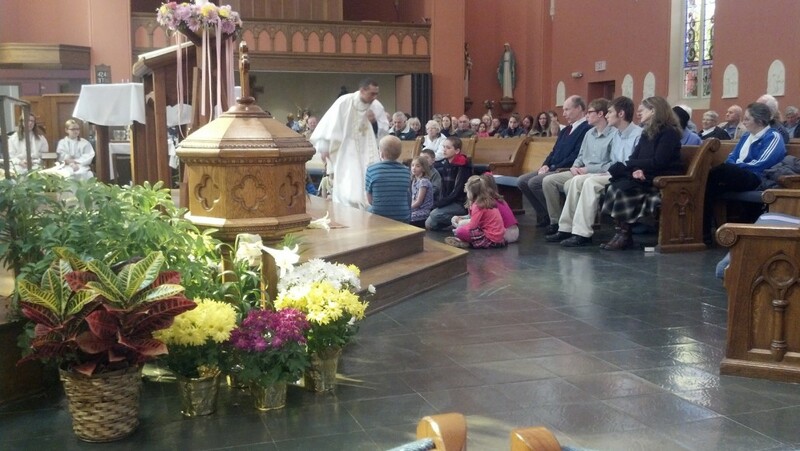 At the same time Father Eugene Weis returned to Tioga County as Pastor of St. Patrick’s. Father Weis had served as pastor of St. John the Evangelist, Newark Valley and St. Francis of Assisi, Catatonk, in the 1980’s. 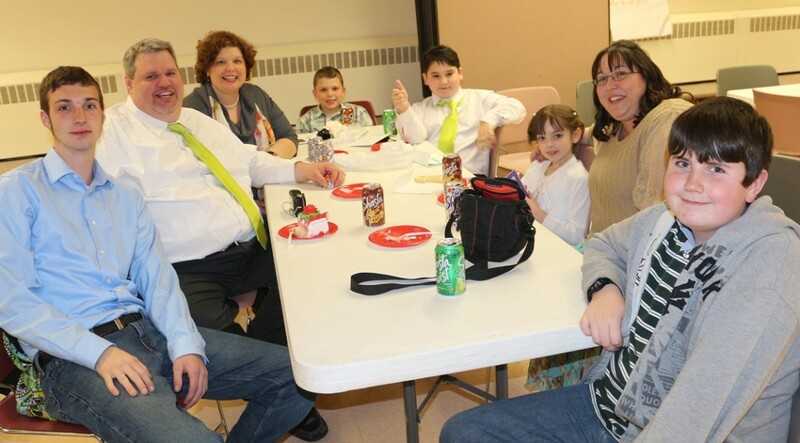 During Father Weis’ three years as pastor of St. Patrick’s, the parish took on their second major fund drive of the decade to repair the Stanbrough House section of St. Patrick’s School. 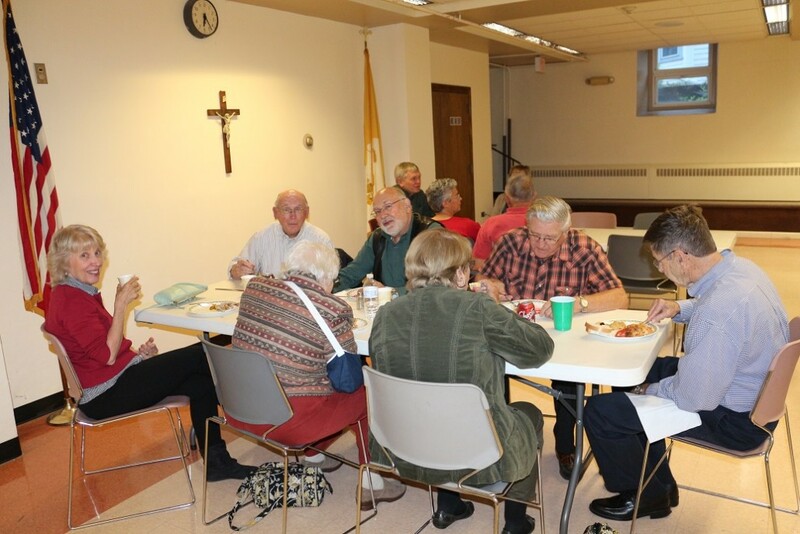 Father Weis was assisted in pastoral care of the parish by Sister Mary Ann Sliwa, who followed Sister Ann Louise Henteges as Pastoral Associate. In June of 1997 Father Weis resigned his pastorate and went on sabbatical. At that time the Diocese of Rochester was beginning a three year Pastoral Planning Process to help all the parishes of the Diocese to plan for the millennium. Rev. William A. Moorby, the pastor of St. John’s, Newark Valley and St. Francis, Catatonk was appointed to serve concurrently as Administrator of St. Patrick’s. Following a year of Pastoral Planning with the parishes of our region a Pastoral Plan was adopted. The plan called for more cooperation between the parishes of the region and inked St. Patrick, St. John the Evangelist and St. Francis of Assisi together as a Cluster of parishes to be served by one Pastor and a Parochial Vicar and a common staff. On June 30, 1998 Father William A. Moorby was officially appointed the first pastor of the Cluster and Rev. Timothy Niven, who was ordained on June 6, 1998, was appointed to serve the Cluster parishes as his first priesthood assignment.